After receiving a letter from Keepmoat’s solicitor we removed our website from view and replaced it with a holding page. This page received several comments which we would like to make available and in context. The holding page is copied as was below. 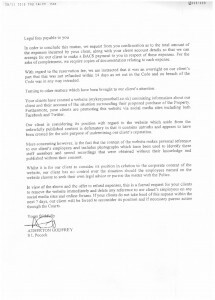 We would like to tell you about the service we received from Keepmoat but they don’t like what we have to say. Rather than address the issues raised, they prefer to threaten litigation. We are not a wealthy family and the consequences of drawn out legal proceedings could leave us without what little we have to start with. Why someone would choose to register this domain name? 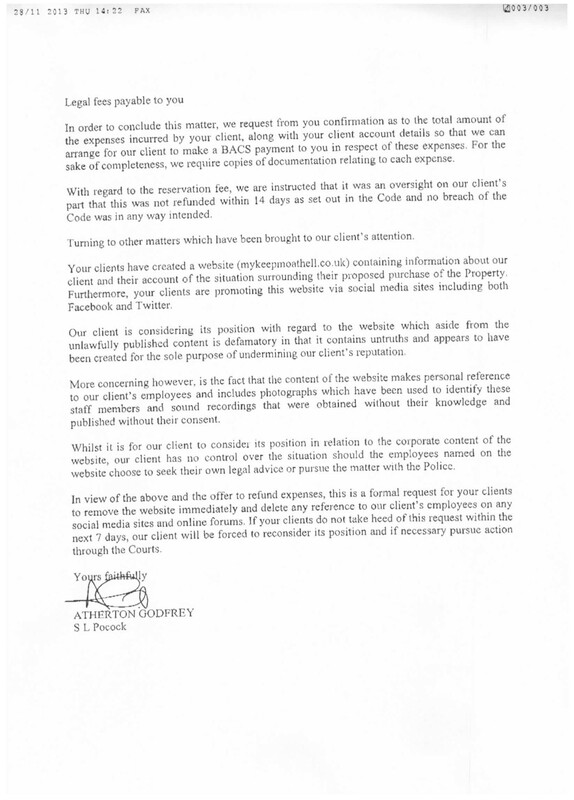 What could need to be hidden from public view so badly that a company would go to the lengths of threatening litigation to get it removed? Would they be prepared to do the same to you? THE BIG BOYS WIN AGAIN, FOR NOW. Hi guys. I think you are completely withjn your rights to set up this website. If they had delivered customer service you wouldnt have. Any information you have provided was set by them amd if they don’t want this shared I believe they know how bad they are and they should not have done what they did. I would also state 2 things 1. Thank god it all went wrong as now you know what a bad company they are and they havent had hundreds of thousands of pounds off you. 2. Take it to watchdog as they WILL SHARE WITH THE WORLD. Regards a BARRATT home buyer. You don’t need money to take any action against to anyone. Please email me and I give you the way to make a complaint. It’s not fair what they did to you. @Leanne – Thanks for the support, yes we believe they know what they did was wrong and that’s why they want it to disappear and pretend it never happened. @Simon – It is not about us taking action against them it is about them taking action against us for libel if we didn’t remove the site. They have offered to cover our out of pocket expenses but that is not really the point for us. Their fax states that we created the website to undermine their reputation. That’s not why we created it, we created it as a warning to others. We believe that people should be allowed to make an informed choice when purchasing a product or service. If someone reads our website and decides not to buy a Keepmoat home that is fine. If they read it and decide they want to buy through Keepmoat that is fine. But we believe they should be allowed to make their own mind up. I think we should voice our opinions and warn others, I have posted lots of photo’s on the flicker site & a few on facebook, they are also on another site “keepmoat beware” the builders advertise so why can’t we. What ever happened to freedom of speech. I have had nearly 4 years of hell and nearly 65, they certainly didn’t build me a high standard quality home as advertised “No easy key move” for me. Biggest mistake of my life. Good luck to all and the site. We also had trouble with the EasyKey – not very easy at all. Seems to us Keepmoat don’t like freedom of speech if you say something negative about them. We’re sure if our site said how fantastic they were they wouldn’t have complained. We would have loved to say how great Keepmoat are – we don’t want to complain, all we wanted was a nice family home for us and our son. I absolutely agree we didn’t ask for these problems, I remember one of their adverts stating ” USE OUR EASY KEY OPTION NO HASSLE & THEY TAKE THE STRAIN AWAY ALL WE HAD TO DO WAS MOVE INTO A BLANK CANVAS, more like a tent. Lets hope we all get our issues sorted out soon, nearly 4 years of stress for me, hope your’s don’t take as long. I suggest in the future you register a .com and utilize Privacy protection. “OVH”, a French company offer free whois privacy on their .com domains and they are priced well. I would also suggest you used CloudFlare (free!) to hide the IP address of your web server. This would severely limit the extent to which they could track you down and try to sue you. My wife and I purchased a property on friars gate in Dudley and it was a nightmare from start to finish. We had an unusable drive for 4 months, windows not sealed properly,marks over the house,badly plumbed items causing leak no floor in kitchen for 8weeks, lied to during sales process claiming only small amount of social housing eg Bromford homes when in fact over 90 properties are social housing. Requested Virgin media ports and paid for never put in so had to have wires drilled from outside, paid a so called service charge of 68quid to keep estate clean but never seen anyone doing anything and litter all over the estate from social housing kids. Can’t use bath due to ridiculous thermostat which stops water getting hot. Absolute joke no help from keep moat no help from bromford. Best thing to do is get together and stop these builders robbing & fobbing us off. Anyone living near to a site they are building on should put banners up, I know they cost a few quid but well worth it. You could do what I did sit outside/opposite their show rooms and when you see someone looking interested in their new homes STOP THEM & SHOW THEM PHOTO’S OF THE POOR QUALITY WORKMANSHIP believe me it works. Of cause I’m lucky because being a pensioner I had the time. I consider myself lucky that we don’t live too near to Brearley Forge as I wouldn’t want to be reminded about our nightmare every time we walked or drove past. Although because of a diversion the other day we did have to drive past to get home – it wasn’t as bad as I thought it would be seeing that place again but I’m still glad I don’t have to see it every day. It can’t be much fun living on an estate when Keepmoat won’t sort the problems out without resorting to using banners – it must leave a nasty taste in the mouth. I think it would spoil the house for me. It is probably lucky for us that we never did buy the house as after all the bad feeling I’m not sure we would have been happy there. Not had much chance to respond to comments. Me and my husband did a Subject Access Request and I’ve doing a time-line of events so hopefully we can understand what happened. 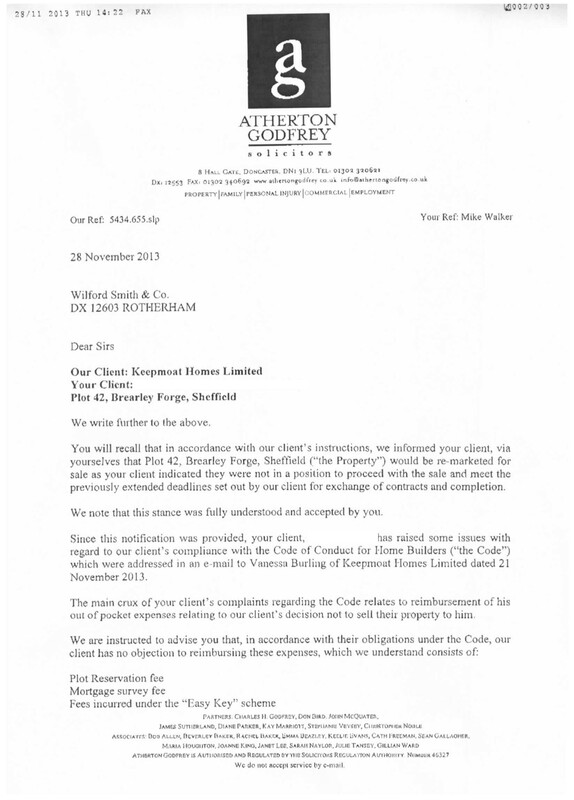 Basically I’m investigating my own complaint because Keepmoat are unwilling or unable to.